The most frustrating thing about Laccaria identification, in my book ("at my Web site? "), is this business about the mycelium at the base of the stem. Is it lilac, or is it white? This character is virtually the only non-microscopic character separating many Laccaria species. The problem is, lilac mycelium fades quickly to white as the mushroom develops, so if you are not looking at super-fresh mushrooms you are likely to miss the purplish hues altogether. Apparently, Laccaria species with lilac mycelium on the stem base develop clearly purplish mycelial cultures in petri dishes--but most of us lack the laboratory needed for culturing our collections. 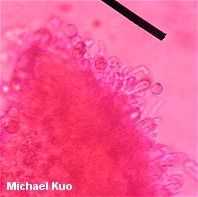 According to Osmundson and collaborators (2005) it may be possible to circumvent culturing: "[s]toring fresh basidiomes of subalpine L. bicolor that originally lacked violet basal mycelia in a covered plastic container under refrigeration has resulted in new growth of violet mycelia at the base of the stipe." I have not tried this method. Laccaria bicolor grows under conifers in western North America and in the Great Lakes region (it has also been reported from West Virginia). Its gills are faintly purplish--and in my collecting experience this coloring is more stable (and more useful in identification) than the purplish basal mycelium. 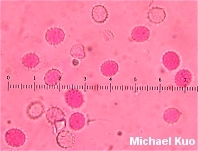 Microscopic features include round to nearly-round spores with thin spines, and 4-spored basidia. If its lilac basal mycelium is evident, Laccaria bicolor is easily separated from most other Laccaria species, with the exception of Laccaria trichodermophora (which appears in the southeastern United States and in Mexico and features pinkish flesh-colored gills) and Laccaria nobilis (which is larger and scalier). However, if the basal mycelium of Laccaria bicolor appears white, one is left with precious little to separate the species from Laccaria laccata (microscopic features nearly identical but gills only rarely with a purplish tinge). 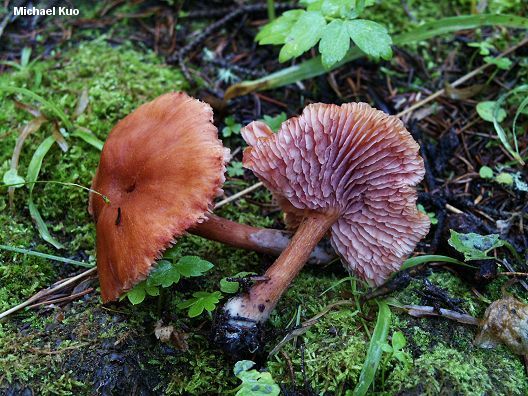 Laccaria bicolor is one of the few fungi to have been completely sequenced; its entire genome was presented in the journal Nature (Martin and collaborators, 2008). Ecology: Mycorrhizal with conifers; growing scattered or gregariously, often in moss; summer and fall; western North America and the Great Lakes region (also reported from West Virginia). Cap: 1-7 cm; convex, becoming flat and sometimes depressed; the margin not lined; finely hairy to finely scaly or more prominently roughened; orangish brown to pinkish brown or pinkish flesh color. Gills: Attached to the stem; distant or nearly so; light purple when fresh, fading to pinkish flesh color. Stem: 3-10 cm long; up to about 1 cm thick; more or less equal, above a slightly swollen base; finely hairy and often longitudinally lined; colored like the cap; with purplish basal mycelium that often fades to whitish. Flesh: Pale purplish or whitish. 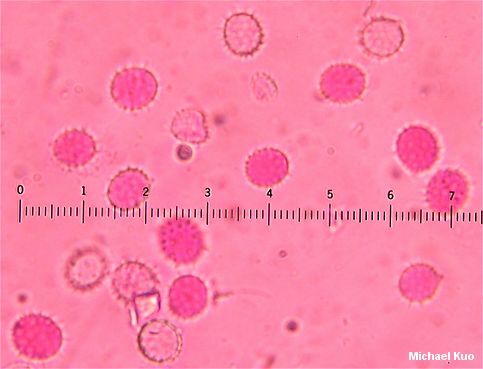 Microscopic Features: Spores 7-9 x 6-8 µ; subglobose to broadly elliptical; spines 1-2 µ long, with bases about 1 µ wide; inamyloid. Basidia 4-spored. 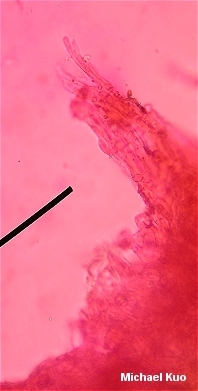 Cheilocystidia filamentous to subclavate; to about 55 x 8 µ. Pileipellis a cutis of elements 5-10 µ wide, with frequent bundles of upright elements; terminal cells subclavate to subcapitate. REFERENCES: (Maire, 1937) Orton, 1960. (Phillips, 1991/2005; Bessette, Miller, Bessette & Miller, 1995; Mueller, 1997; Roody, 2003; McNeil, 2006; Martin et al., 2008.) Herb. Kuo 09039405, 08140305, 08190703.